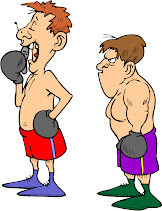 Over at Boxing Aches, my friend Duncan Higgitt recounts his Tuesday night sparring session. I know the feeling he describes. Good job, Duncan! I hope you and Paul keep up the fine work!